5 Common PCB Design Mistakes to Avoid - Sierra Assembly Technology Inc.
Advanced manufacturing techniques and innovative design tools have enabled Printed Circuit Boards (PCB) manufacturers to bring down the cost of PCBs in the past years. Many times, the cost of production increases due to errors in the PCB design. Hence, it is very important for PCB designers to avoid such fabrication errors, while designing PCBs. 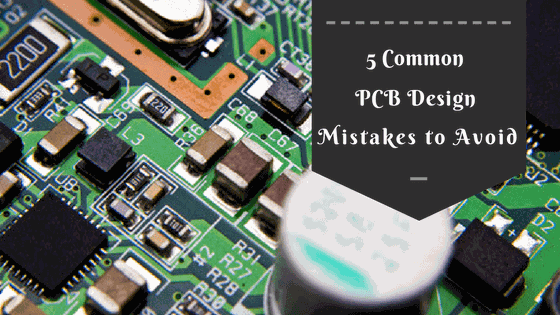 Read this post to know common mistakes that happen while designing PCBs, and how they can be avoided. Below are a few design mistakes mentioned, which a PCB manufacturer should avoid while designing one. Over complicated designs: The basic working methodology behind the PCB fabrication helps the manufacturer develop printed circuit boards (PCBs) in the most economical and easiest way. However, an overcomplicating design may cause several problems like a schematic imbalance. This may affect credibility and productivity of a PCB designer. Hence, a designer must focus on the effectiveness of the design and must simplify it to avoid design errors. Incorrect layout of the antenna in the wireless design: If the circuit board is using wireless technology, then a correct antenna layout is important. The impedance of the transceiver and the antenna must be matched, in order to ensure maximum power transfer. A proper transmission line is needed to connect the transceiver and the antenna. Generally, the transmission line is made with 50 ohm impedance for maximum power transfer within the antenna. Fabricators must make a special note on installing the antenna correctly in order to provide effective circuit board design. Minimizing Slithers: Slithers are undissolved copper chunks that may stick to the circuit board during the chemical etching process. These slither may cause short circuits and several other manufacturing failures. A PCB designer should always ensure that the minimum copper width is above the manufacturer’s requirement. This helps to minimize slithers, and produce properly working for circuit boards. Landing Pattern Errors: Libraries of electronic components are available in the PCB design software packages. Schematic symbol and PCB landing pattern for each component are a few of components included in the library. The schematic symbol and the landing pattern are to be drawn manually if the components are used outside of the libraries in PCB software design package. This may increase the probability of errors. Decoupling capacitors: The decoupling capacitors provide stable voltage to components on the printed circuit board. They are placed closer to the pin to ensure a stable voltage. The trace powering the supply rail must pass through the decoupling capacitors before reaching the pin. If this happens, then stable voltages can be provided. Hence, the PCB designers need to utilize the decoupling capacitors effectively. As discussed PCB layout design requires ardent precision and great technological skills. Mistakes in PCB layout can lead to huge losses. Therefore, controlled PCB design is an important check to prevent any low-quality products from reaching the market. Are you trying to build your own PCB? Well, in that case, it is always better to approach an industry expert with a vast experience. Sierra Assembly Technology Inc.is one of the reputed PCB manufacturers offering a vast range of PCB solutions.